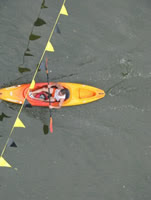 Join other veteran and amateur athletes as they run and kayak through the 7th annual Chiques Challenge hosted by the Susquehanna Valley Chamber of Commerce. This duathlon slated for Saturday, August 12, will stage from Columbia’s River Park at 41 Walnut Street. Participants will be transported to Vinegar Ferry Road for the 8:30 a.m. start time. The course takes runners along the Susquehanna River via the Northwest Lancaster County River Trail and through the streets of Marietta. The run portion of the event ends at the Marietta Boat Launch. There, runners will take to the river aboard a kayak and finish downstream at the Columbia River Park. Offered again this year is the option to enter as a team with one participant handling the running portion while the other takes on the kayaking duties. This annual event is held rain or shine. It is made possible through the Gold Sponsorship of Lancaster County Solid Waste Management Authority and the sponsorships of additional businesses listed on our website. Pre-registration is required to participate in the Chiques Challenge. This year’s event is limited to 150 participants. Participants must be at least 16 years old. Registrants need to provide their own kayak, but may contact Shank’s Mare or Chickies Rock Outfitters for assistance with kayaks. All participants are required to wear a life vest at all times during the kayaking leg and to be equipped with a whistle. For more information or a registration form, visit www.PaRivertowns.com or call 717-684-5249. Please, no pets. This is a FUN event! Even though it is timed and participants may feel competitive, the main focus is to have some fun along and in the Susquehanna River! The Susquehanna Valley Chamber of Commerce & Visitors Center is a 501(c)(6) non-profit organization serving the tri-borough communities of Marietta, Wrightsville & Columbia, PA as well as the outlying areas. Annual fundraising events such as this help to keep the Visitors Center open year-round as a gratis service to guests to our region.